Restaurant Sat Bains situated in Nottingham is the most ‘Northern’ of the 13 Two Michelin Star restaurant in England (there is 1 in Scotland) and is just a 90 minute drive away from me which was a welcome change from having to travel to London/South East. The restaurant has 8 of it’s own rooms and since it’s actually located a couple miles outside of the city centre it seemed a good idea to book a room along with our reservation. As with many top restaurants these days credit card details are required to confirm a reservation and in the event of a no show or late cancellation you’re charged a cancellation fee. I totally understand why the restaurants need to do it and thankfully i’ve never been effected by it, until now. I can’t describe how I felt when just after midnight on the day of my reservation I came down with a sickness bug and spent the next few hours with my head in the toilet. The reservation had been made months ago and it was such unbelievable bad luck for this to happen just hours before we were due to leave. The feeling went from bad to worse when I checked the Cancellation Policy, not going would cost me £360. By midday I was feeling a little better and managed to keep some lunch down so decided i’d go anyway, I was nowhere near my best and if I was able to cancel I certainly would have done but I couldn’t bring myself to pay £360 to stay at home. After a stressful and much longer than expected drive we finally arrived at around 7pm, an hour before our reservation. Amanda seemed to sense that we’d had a difficult journey and offered to delay our reservation which we gratefully accepted. We made our way up to the room which apart from being far too hot was loverly, a nice mix of classic wood with a modern twist. 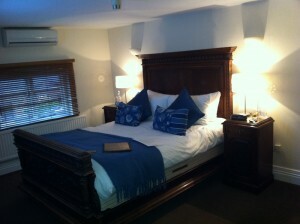 The big wooden bed was super soft and the standalone bath was huge. My partner fell asleep within minutes. I watched Daniel Clifford win his heat on Great British Menu. When it was time for us to get ready I woke her up and found that she really didn’t feel well at all. I optimistically suggested that it may have just been the effects of the journey and heat in the room but deep down we both kind of knew that she was probably coming down with the same bug. We went down for drinks in the bar at 8:30, neither of us felt like Champagne or Prosecco, our usual choice of apéritif so we settled for Diet Coke & ginger beer whilst we considered the menus. 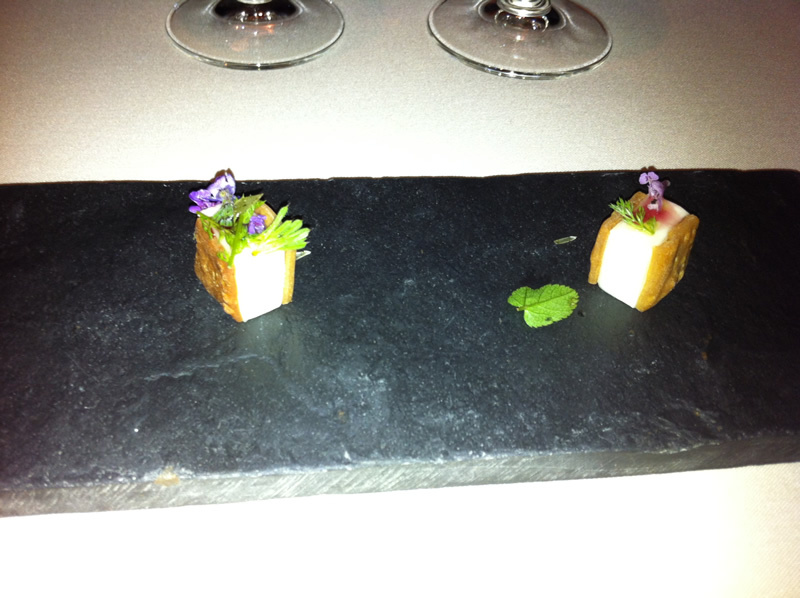 Sat Bains are a tasting menu only restaurant with a choice of either 7 or 10 courses. Even though we weren’t at our best we couldn’t resist ordering the 10 course. I say we, my partner insisted that she wouldn’t be able to eat much, if anything but as the whole table has to order the same menu she didn’t really have a choice. 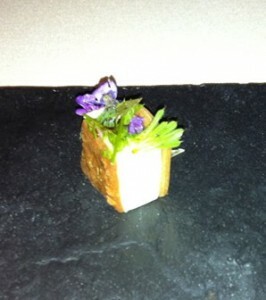 First up was a canapé of horseradish ice cream sandwich with lovage & elderflower. Don’t worry if horseradish ice cream doesn’t sound very appealing to you, it didn’t to me either but I can assure you that it was delicious. The flavours were incredible in something so small and all worked perfectly together. We were also served an amuse of nettle soup and horseradish panna cotta which tasted good but wasn’t set at all, i’m not sure if this was intentional or not and I don’t know if a panna cotta needs to be set to officially be considered a panna cotta but although it tasted good I am not convinced it should be called a panna cotta. What we got was probably the best 2 scallops i’ve ever eaten in my life with some very interesting textures of leek. 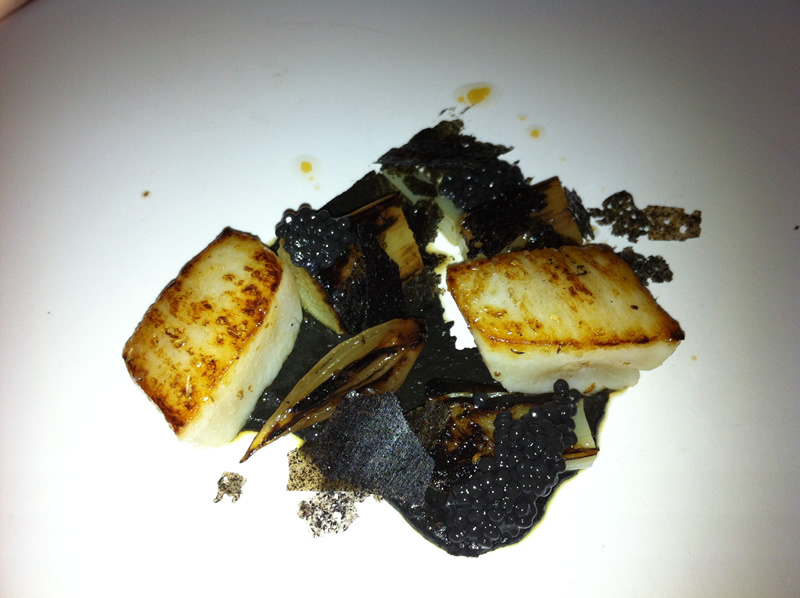 The scallops were HUGE and presumably quite a bit of them was left in the kitchen to give them such sharp edges. They were cooked to perfection, seared and starting to caramelised on just about cooked in the centre. 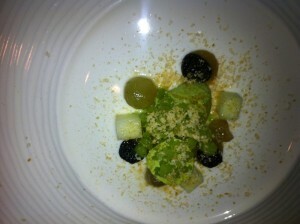 The leeks came in many different forms, including puree, a tuile and spherified ‘caviar’ balls. 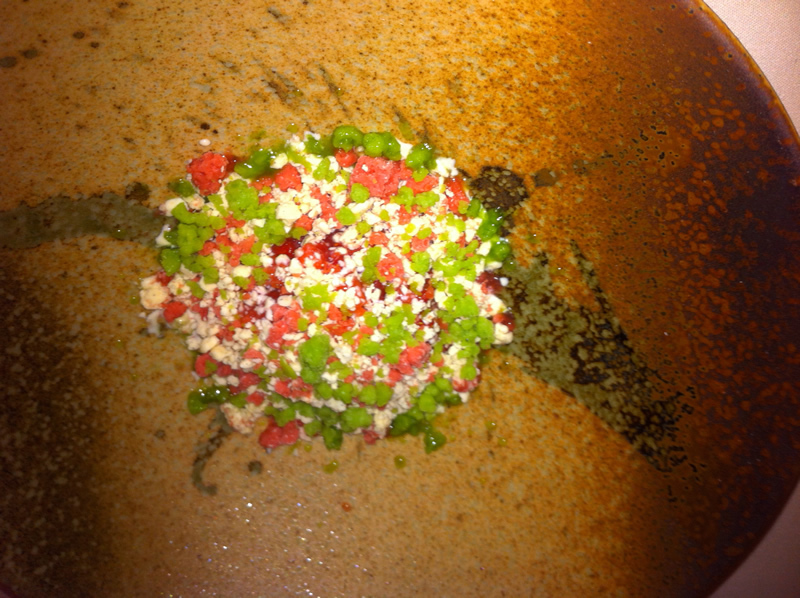 I’ve never considered new potatoes to be fine dining before but they were in this dish. Maybe the amazing ham (which Sat has helped develop on a local farm) helped as well as the delicious onion juice which had a hint of garlic. This was perhaps my least favourite dish of the day. I’m not a huge lover of liver and would never order it but I am always open to be proven wrong, especially by great chefs. This dish almost did it, I loved the concept and I have no doubt that anybody who enjoys liver, particularly duck liver would love it. The duck liver was cold which was a surprise and is hidden underneath the more conventional muesli ingredients which were very tasty. The ultimate ‘spring’ dish. Vibrant colours, light fresh & clean flavours. The salmon was soft and rare, cooked in a water bath I think. 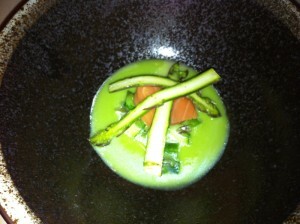 The asparagus gazpacho was amazingly concentrated and the fresh asparagus on top added a crunch, a perfectly balanced dish. Like the duck liver i’d also never have ordered a ‘Waldorf salad’, not because I don’t like any of the ingredients but because I just don’t really order salads. Of course I should have known better by now not to expect an actual Waldorf salad. What I got was the flavours of the traditional Waldorf but in very different forms. There was celery panna cotta, salted apples, raisin purée, alcohol soaked grapes and a shaved walnuts. Very clever and very tasty interpretation of a classic. 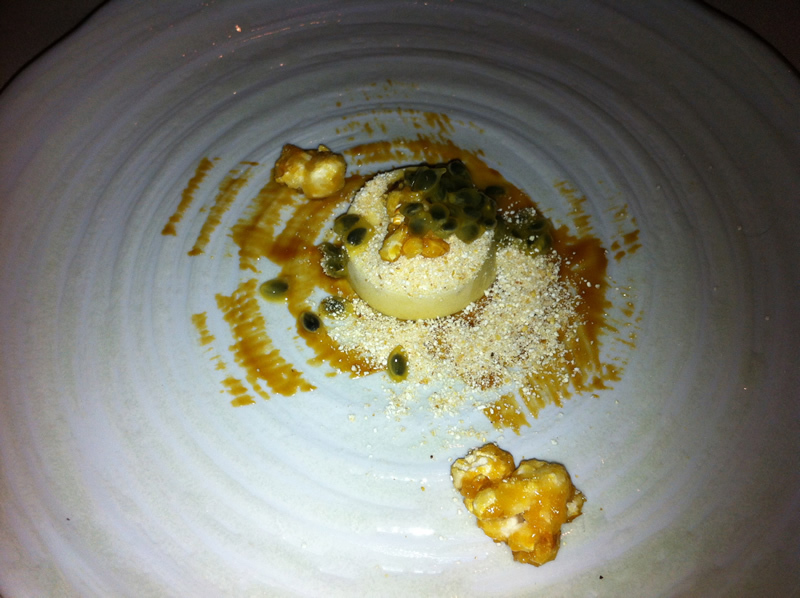 I’m very grateful that this was part of a tasting menu otherwise i’d never have experienced such an amazing dish. 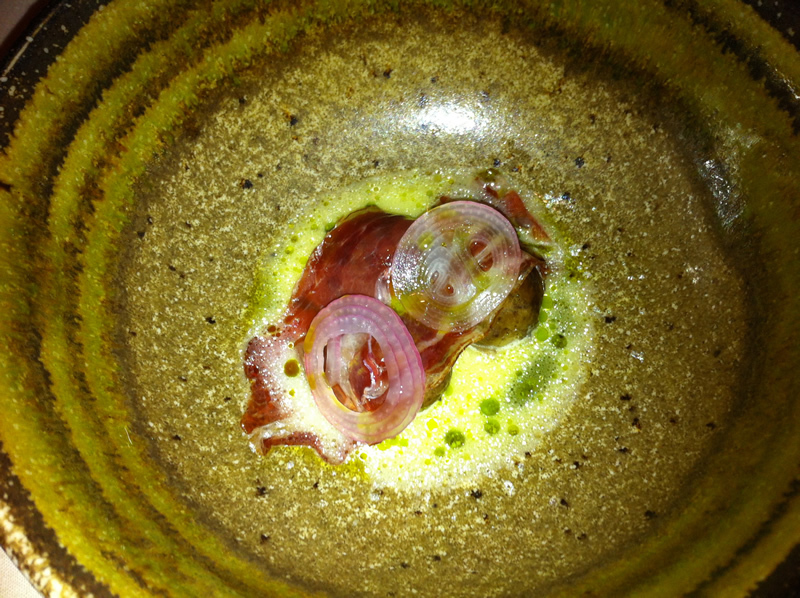 This was probably my favourite dish overall. It may not be as interesting and exciting as some of the others but it was stunning in terms of presentation and flavours. 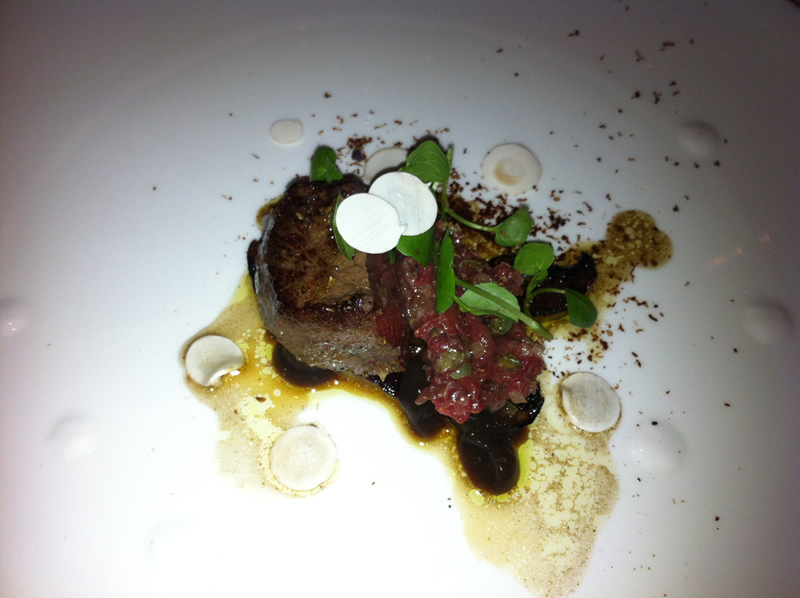 The venison was incredibly juicy & tender, the dark chocolate worked brilliantly with it, the mushrooms added earthyness. Just a stunning dish. Up to this point my poor fiancee tried her best to have a taste of each dish despite clearly not being well, I benefited from some extra food but she was still leaving a lot. The staff were understandably concerned that there may have been something wrong with the food which we assured there wasn’t. When they realised that she wasn’t well they couldn’t have been nicer, checking up on her, bringing hot water & lemon etc.. Unfortunately by the time this course arrived she gave up and run to the toilets, I went to see if she was OK 10 minutes later and found her in the same position i’d been most of the previous night. When she was up to moving I took her upstairs to bed, and then returned to the restaurant to finish the meal alone. This was designed to switch the palate from the main courses to the sweet, it was a lolly made from white chocolate & beetroot parfait dipped in freeze dried raspberries. The beetroot flavour was very subtle but enjoyable and worked well with the raspberries. I was well and truly ready for dessert! This was the dish I was most intrigued by the from the menu and I wasn’t disappointed. The sweetcorn element was almost like a cheesecake topped with passion fruit & umami rich miso. 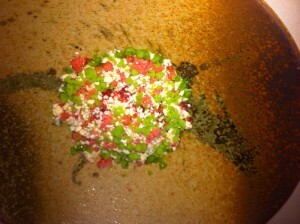 It was a very clever, perfect balance of sweet, sour, salty & savoury. I have to admit that although I love coffee i’m not a fan of coffee flavour in food. I was hoping that Sat would be able to make me enjoy it but unfortunately even he couldn’t, at least not the coffee part which was a super thin coffee brittle. I didn’t really enjoy the olive oil & balsamic element either, i’m not even sure what it was supposed to be really it was a blob of almost jelly like texture that didn’t taste or feel good to me. They were the only 2 bits of food that I left all night. What I did enjoy was the chocolate mousse which was immense! So deep, dark and rich, utterly amazing. Like the Waldorf Salad I wasn’t expecting much from this dish purely from the menu description (no, I still hadn’t learnt by the last dish!) but how wrong I was. Of course it wasn’t just strawberries & cream. It was an amazingly intense strawberry compote topped with freeze dried shards of strawberries, cream & rocket! 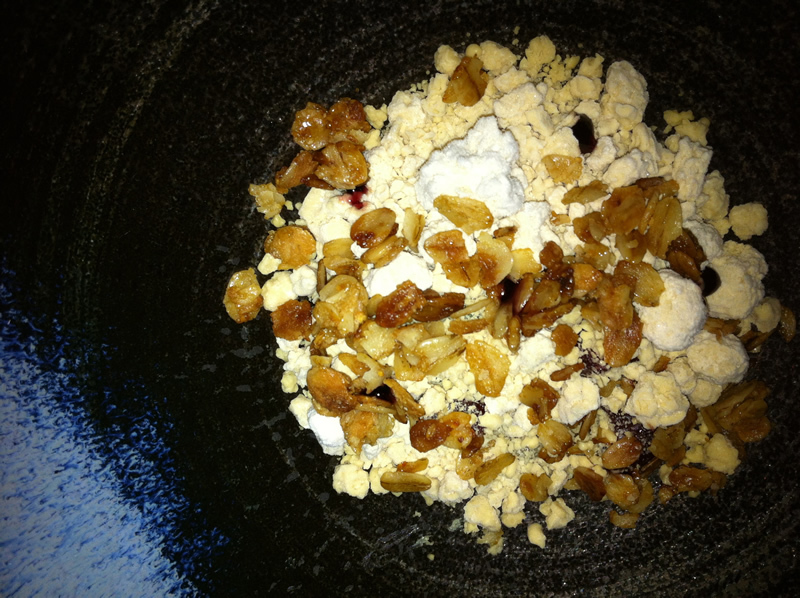 It was light and packed with flavour, a delightful end to a really great meal. I reluctantly decided to leave coffee and petit fours to go and see how my poorly fiancee was doing they looked amazing though. I did have a great time at Sat Bains despite the circumstances. I can’t thank the staff enough for how well they looked after us. I will definitely be going back when we’re both healthy.